Note: The table takes dual responses (for example if someone is French-Canadian he/she would be added to both French and Canadian). Some places of one's ethnic origin do not refer to a single specified country of origin, i.e. Spanish refers to people from Spanish speaking countries such as Colombia, Spain, Mexico, Cuba and others; or East Indian where the respondents origin could be from Pakistan, India, Nepal, Bangladesh, etc. ; and the list contains about 200 nationalities known to reside in the province. However, there are options for the respondent to identify the country alone. 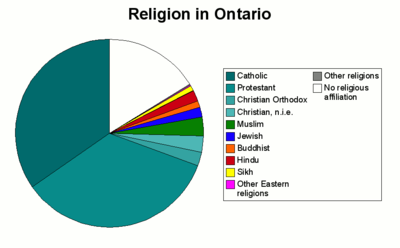 Ontario is a very diverse province. For example, 54.8% of the population of Toronto was born outside Canada, which is the second-largest percentage of immigrants in a single city on Earth, after Miami. Hamilton is ranked the third-most diverse urbanized area in Canada (after Toronto and Vancouver). Ontario's interprovincial migration rate have shifted over they years. It was negative in the 1970s, positive in the 1980s, but then negative again in the 1990s. It went back to the positive in around the time of the turn of the millenium for a few years, but has been in the negatives constantly from 2003 to 2015, and has been in the positives since then. Over the period from 1971 to 2015, Ontario was the province who experience the second lowest levels of interprovincial in-migration and out-migration, second only to Quebec. As of the 2016 census. ^ "Population and Dwelling Count Highlight Tables, 2016 Census". 12.statcan.gc.ca. Retrieved 27 May 2018. ^ a b "2011 National Household Survey Profile - Province/Territory". 12.statcan.gc.ca. Retrieved 27 May 2018. ^ "Immigration and Ethnocultural Diversity Highlight Tables - Ethnic Origin, both sexes, age (total), Ontario, 2016 Census – 25% Sample data". 12.statcan.gc.ca. Retrieved 27 May 2018. ^ "Census Profile, 2016 Census Ontario [Province]". Statistics Canada. November 29, 2017. Retrieved January 6, 2019. ^ "Population by visible minority group, place of residence and projection scenario, Canada, 2011 and 2036". Statistics Canada. Retrieved January 6, 2019. ^ "Projections of the Aboriginal Population and Households in Canada, 2011 to 2036" (PDF). Statistics Canada. September 17, 2015. Retrieved January 6, 2019. ^ "TMMIS - Committees" (PDF). Toronto.ca. Retrieved 27 May 2018. ^ "Interprovincial Migration in Canada: Quebeckers Vote with Their Feet" (PDF). www.fraserinstitute.org. Retrieved 2018-12-26. ^ "Population and dwelling counts, for Canada, provinces and territories, census metropolitan areas and census agglomerations, 2011 and 2006 censuses". 12.statcan.gc.ca. Retrieved 27 May 2018. ^ "Population and dwelling counts, for Canada, provinces and territories, census metropolitan areas and census agglomerations, 2006 and 2001 censuses - 100% data". 12.statcan.gc.ca. Retrieved 27 May 2018. ^ "Population and Dwelling Counts, for Canada, Provinces and Territories, Census Metropolitan Areas and Census Agglomerations, 2001 and 1996 Censuses - 100% Data". 12.statcan.gc.ca. Retrieved 27 May 2018. ^ a b "Population and Dwelling Counts, for Census Metropolitan : Areas in Decreasing Order of 1996 Population, 1991 and 1996 Censuses - 100% Data". Statcan.gc.ca. Retrieved 27 May 2018.